Gold Loans are gaining popularity in our country and while they are better over a lot of other types of loans, here are some things that you should keep in mind before getting Gold Loans in India. With television commercials singing ‘jab ghar mein pada ho sona, fir kahe ko rona’, the number of people opting for gold loans has increased. Also a lot of banks and NBFCs paint an emotional picture of themselves with how they pray for your gold and keep your life’s savings in Gold safe till you repay the loan. All these and a general awareness that there are other ways of getting loans instead of the typical personal loans and credit card loans (you can find other alternatives to personal and credit card loans here); Gold loans have seen an increase in popularity. 1. Short Term Loan: First and foremost, Gold Loans are for Short term only. They are usually for a period of 1 year and in some cases to 2 years at max. Hence make sure whether you are able to repay the amount of loan in that time frame or need more time. If you cannot repay in this much time, Gold Loan is not for you. However if you can, then Gold Loans are a good way of getting fast cash to fulfill the financial void in case of emergencies. 2. Rate of Interest: While rate of interest on Gold Loans is lower than Personal loans on any day; there is still a difference in interest rates when it comes to Gold Loan provided by NBFCs and those given by Banks. Banks will charge lower interest than the NBFCs and public sector banks charge the lowest among that. So if you can avail a quick gold loan from a bank, prefer that over any NBFC. Your local jeweler may too give you a Gold loan and that too at a much lower rate of interest than banks or NBFCs. But make sure you know them personally and trust them. 3. Calculation of Gold Value: Remember that the amount of loan you are entitled to get is limited up to 80-90% of the value of Gold you pledge against it. So if the value of your gold (in any form jewellery or coins etc.) is say 1,00,000 INR then you can get a gold loan for an amount up to 80,000 to 90,000 INR only. 4. Calculation of Loan amount: The other thing to consider is the way in which the valuation of gold is done by the lending institution. Some calculate the last 2 weeks gold prices and then take an average price for determining the rate per gram of gold; while some take the daily rate for valuing your Gold. Consider which one suits you and gives a higher value to your gold. For example if the average of last 2 weeks comes to Rs. 26,500 while today’s gold price is 27,000; it makes sense to go to the one offering to value it on that day’s rate and vice-versa. 5. Credibility of your lender: Gold Loans are fast and require almost nil paperwork and there is a reason to that. For the lender it is a secured loan to give as they have your Gold with them as a security in case you plan to not pay up or default on your payments. However, this also raises the question of safety of your Gold till the time it is mortgaged with them. Do a thorough check of the lender and what sort of safety measures they take to safeguard your Gold while is stays with them before availing a loan from them. Always choose the ones that have a proven track record and are reputed even if it means to pay some higher interest rate, as ultimately your Gold’s safety is important. 6. Type of Gold pledged for loan: One thing you should be aware of is that the lending institutions and banks in particular prefer gold jewellery over gold coins to be pledged as security for Gold Loans in India. They feel jewellery has a sentimental attachment and thus ensures timely repayments to safeguard it against confiscation by the banks for non-payment. However you can always negotiate on this part and can settle for a slightly lower amount or change in the rate of interest or repayment terms, in case you have more of coins and less of jewellery. Or you can opt for the institution that accepts coins as well. Also Read: Credit Card Loans vs. Personal Loans: Which one should you choose? 7. Past repayment or default in loans: If you plan to go to a bank where previously you have defaulted on loans or credit, they may club this with the outstanding amount and you may have to pay up the previous outstanding amount before you can get your gold back even after repaying your gold loan. While I do not encourage any non payments or you defaulting on any payments; if you have so in the past, just be careful before going back to them. 8. Repayment structure: The repayment structure in case of Gold Loans is flexible as compared to any other loans and you can opt for just paying interest through EMI for the entire tenure and at the end of the tenure you pay your principal amount and take your Gold back. However, some banks may also want you to pay some part of principal in your EMI along with interest. So be sure to understand the repayment terms carefully before availing Gold Loan. Gold Loans are probably the easiest and fastest to get and hence are preferred more and more now a days with a lot of people being open to it and not looking it as a matter of shame, like it used to be. 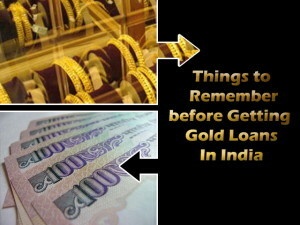 But still one must be aware of the above points before opting for Gold Loans in India.